Posted January 14, 2019 by Ellen & filed under Uncategorized. 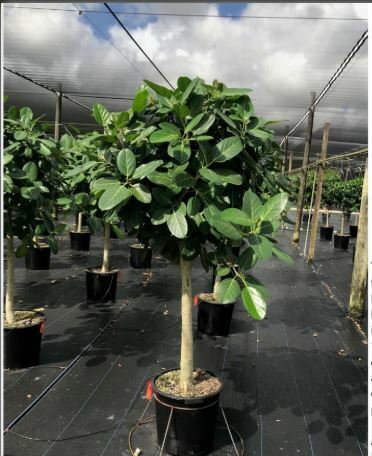 There is a new ficus cultivar in the plant industry: Ficus benghalensis “Audrey”. This beauty has crisp, green velvety leaves that appear to be soft. Along with the beauty of the leaves, this plant features a show-stopping white trunk. Audrey is fast growing and can be either left with a “wild” look or can be pruned into the typical “lollipop” style with a full, round head. Audrey thrives in bright, indirect light, but should not be overwatered. Best of all, Audrey does not have the reputation of being finicky as it does not lose its leaves when stressed. Audrey should be a welcome addition to the indoor plant world!